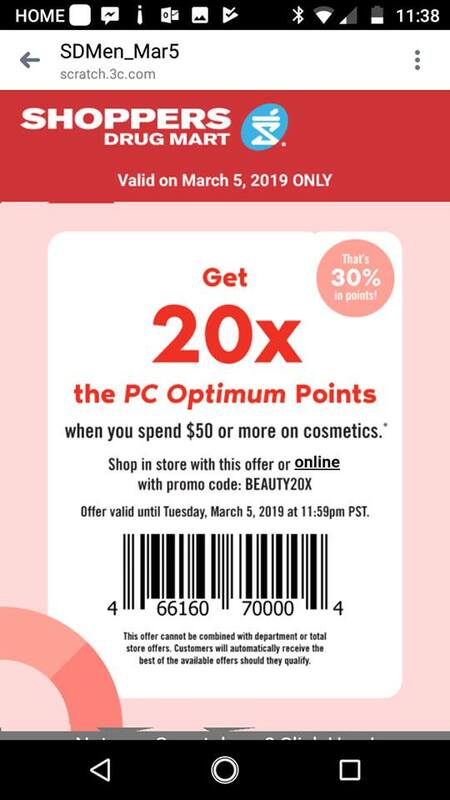 Today only, you will receive 20x the PC Optimum points when you spend $50 or more on cosmetics at Shoppers Drug Mart Canada. To participate in this offer, you can check your texts from Shoppers Drug Mart Canada. This offer was sent out this morning. If you have not signed up to receive texts, you can still use this offer by presenting a screen shot of the bar code above at the register. If you would prefer to shop online you can also get this offer by entering the code BEAUTY20X at checkout. The code is working, and you will see the number of points you will receive when you get to the checkout screen. If you are shopping in store keep an eye out for the Quo mini eye makeup remover pads. These are on sale this week for $3 and you will receive an additional 10,000 PC Optimum points for every two purchased if you are lucky enough to come across them. Be sure to check the travel section as well as the Quo wall display. Click here to view the Shoppers Drug Mart flyer for this week.